I enjoy both throwing at the wheel, and building pots by hand. Each mode of making has its own pace and its own possibilities. I also like to throw components that can be incorporated into hand built construction, like my big jars, and some of my teapots.I spend a lot of time on the surface of my pots, stamping and carving. The carving is really more like drawing with a fine wire tool – a relief line is cut away to make the design. I find this to be satisfying work, and am always happy to set out a board of fresh pots to decorate. It’s primarily thrown work that receives detailed surface carving. I like the work to be nearly too dry to carve when I actually do the work – I get better line quality that way.Hand built pottery starts out as flat slab – easy to stamp and texture with latex mats that I have made myself. I also make all my own stamps – any clay will do, just dry, cut, carve, and bisque. I try to put a few new ones in every bisque load.With every firing, there are new possibilities for learning; chance combinations of clay, slip, and glaze, that can be incorporated into the design of the next series of pots. The unpredictable collaboration of salt vapor and kiln position, coupled with surface imagery and clay body properties, makes each pot unique. 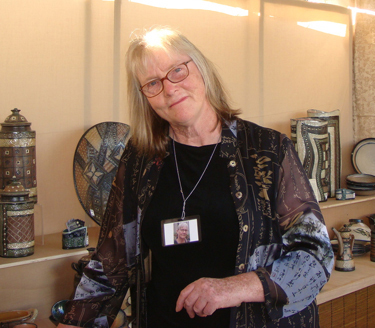 Extraordinary possibilities are revealed – artistic nourishment for a working potter.